When Rigg and his friends crossed the Wall between the only world they knew and a world they could not imagine, he hoped he was leading them to safety. But the dangers in this new wallfold are more difficult to see. Rigg, Umbo, and Param know that they cannot trust the expendable, Vadesh ? a machine shaped like a human, created to deceive ? but they are no longer certain that they can even trust one another. But they will have little choice. Because although Rigg can decipher the paths of the past, he can't yet see the horror that lies ahead: A destructive force with deadly intentions is hurtling toward Garden. If Rigg, Umbo, and Param can't work together to alter the past, there will be no future. I was incredibly excited for this book to come out. I absolutely loved Pathfinder, the first book in the series. I was totally taken in by the story of Rigg and his journey to self-discovery. SPOILER: Once Rigg and his companions made it through the wall in book #1, I was gasping for breath in anticipation of Ruins. I could not wait to see what would happen! 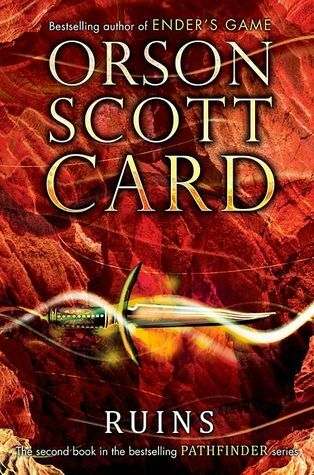 The thing about Orson Scott Card, and what you already know if you have read any of the Ender series, is that his first book is usually awesome, and as he starts to develop the series, the books get progressively complex. And maybe not in a good way. At times, I think Card forgets that his readers are rarely the literary elite. Kids read Ender's Game. Kids read Pathfinder. And you know what? Kids are going to find the subsequent books confusing. I think Card gets too involved with his trickery and brain games - so much so that you get lost in it unless you are keeping notes. Which I didn't. Oops. We know from book one that Rigg has the gift of seeing people's paths. His friend Umbo is able to travel back and forth in time. His sister, Param, can slice time so that she can travel forward quickly without living the moments in-between her jumps. They begin to explore a new wallfold - Vadeshfold - and must use their powers to find out what is really happening in the world. I will try not to give away too much, because there are some major surprises in this book. I definitely enjoyed Card's exploration of group dynamic and personal development. We get to see real insights into the main character's dispositions and relationship to each other as they go through various decisions. Whether you like the characters or not, Card definitely sticks to them and could care less about your feelings towards them. I appreciate that his characters are not stereotypical. They have good and bad qualities. They grow. They learn. They change. As the book goes on, things start to get more complex. Nothing is ever as simple as Back to the Future when you are talking about time traveling. The group continues to struggle as they go into a third wall fold and finally learn about the destructive force spoken of in the summary. And this is where things go bonkers. So, from what I can tell, there are the Expendables, which are in communication with each other, and with the ships (which are on the planet... uh... that might be a spoiler? ), and they are all in communication with satellites (or ships?) in the atmosphere. I think. And the Expendables always tell the truth. Or the lie. Still not sure about that one. And some organisms know everything, and some know nothing at all. Someone is pulling the strings, but it is hard to really tell who because everyone is playing at their own game. Actually, I am surprised I could even write that, because my brain started to fuzz over about 2/3rds of the way through. Anyway, despite the confusion, I did like this book, just not as much as the first. It was not as clear, and I was not as happy about the ending. Rigg does something that I felt was really incongruous with his character. Like the first, it is a cliffhanger and I am sure book 3 will be out in a year or two. At least Card does take his time to get things how he wants them to be. I do want to read it, because I am still perplexed on the final decisions everyone makes. I did not fully understand the "whys" that popped up towards the end. Hopefully book 3 will outline them a bit better. This series does have the potential of going on and on, just like the Ender series does. Personally, I hope it doesn't. Though I would love to see Rigg and co work their way through the other wallfolds, I don't think it is necessary to the core of the story, and am much more interested in seeing what happens when the "destructive force" comes. THAT is a story that definitely needs to be told, and I am looking forward to it.